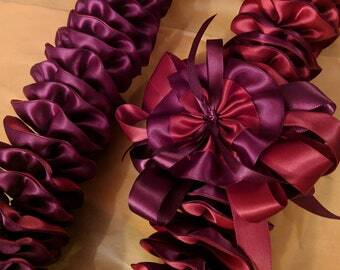 Three strands of the Single Ribbon Lei are used to create this Triple Strand Ribbon Lei. 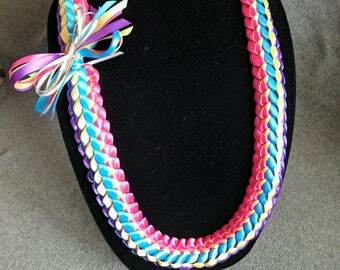 We use 3/8" satin ribbon in your choice of colors. The use of 2 or 3 colors is a favorite. If you'd like, you can choose up to six! The lengths graduate in size from 36", 38" and 40" . Please specify if you require them a bit longer. Colors are only limited by your imagination! If you need a third color or more, please specify in comments when purchasing. These are custom made as ordered and will take 1- 2 weeks to create, please allow time for custom creation. During high volume graduation season, please allow up to 3 weeks. Choose your shipping option accordingly. Loved it! Beautifully done. Can't wait to give it to my daughter at graduation. I love it! 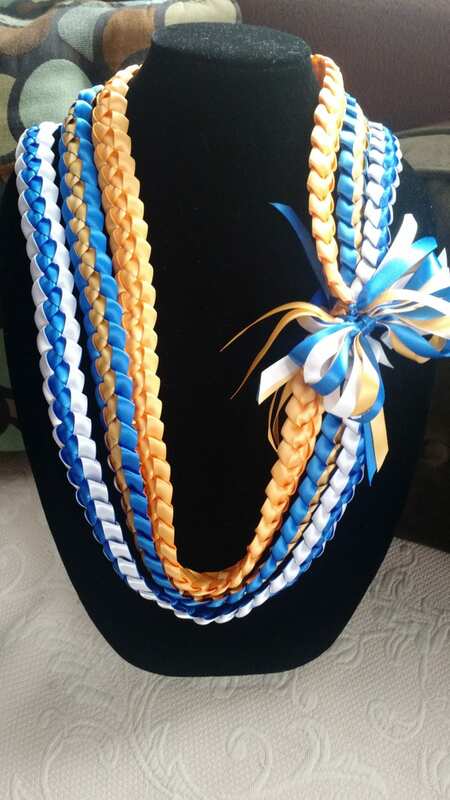 This three strand lei is beautiful and the colors were exactly as I asked for (UCLA themed). I would absolutely purchase more graduation leis from her store again. Thank you! !